This is the second installment of a three-part blog and video series about renewable energy on Martha’s Vineyard. 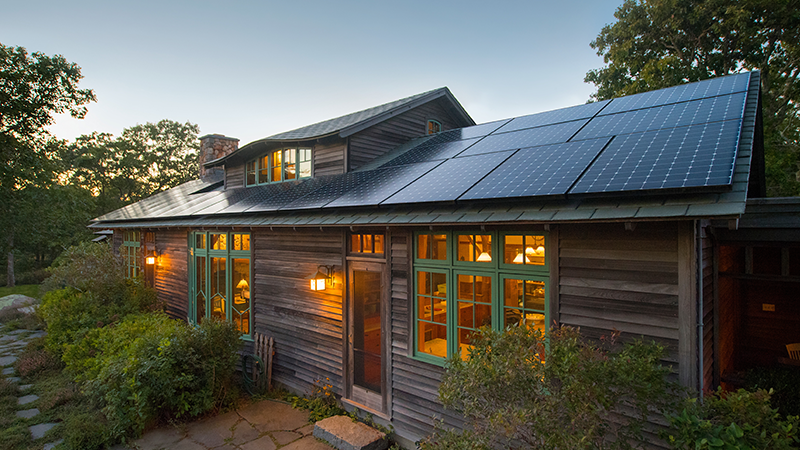 South Mountain Company, an integrated architecture, engineering, design, and build firm, has been bringing renewable energy to Martha’s Vineyard for more than 40 years. 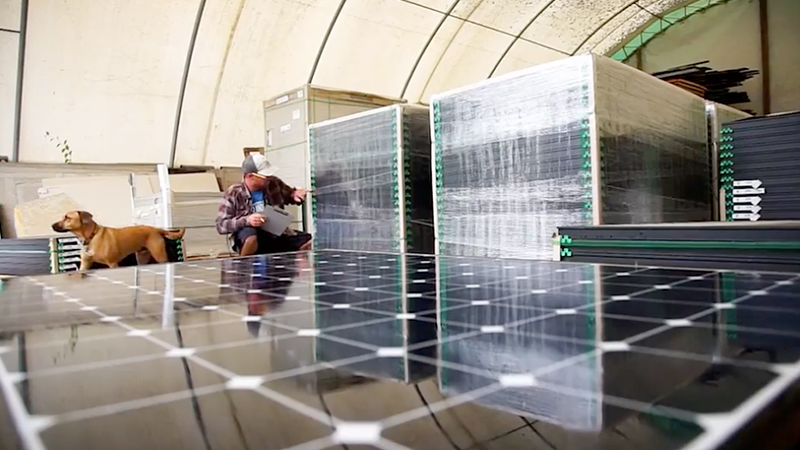 Pioneers in the industry, SMC has developed a unique approach to integrating renewable technologies to make the most of available sustainable resources. After updating HVAC systems, improving insulation and ventilation and making other efficiency improvements, SMC can then accurately determine what size solar system will meet the client’s electricity needs, today and tomorrow. Holistic, big-picture thinking is a hallmark of SMC. Internally, they have a design-centric process where all parts and systems work together to deliver maximum value from solar energy. But it’s not enough for a building to be energy efficient. To meet SMC’s standards, the building must also complement the existing landscape, treading lightly on the surrounding natural environment. “Using technology in ways that harmonize with the beauty and history of Martha’s Vineyard is a challenge,” said Abrams. SMC conquers this by bringing together the precision and skill of in-house master woodworkers, architects, engineers, interior designers and builders together on every project. Building materials and technologies are highly scrutinized before being adopted by SMC. They look for like-minded partners such as SunPower that share a commitment to sustainability and deliver high quality products that can preserve the island’s natural appearance. “We're very concerned with aesthetics. SunPower does it for us like no other solar panel,” Abrams said. Installing SunPower® panels, which have a very low profile and fewer visible parts than conventional panels, allows SMC to create powerful solar arrays that complement a building’s design. Whenever they can, SMC also uses recycled materials. Much of the lumber they use is reclaimed from all over the country, adding rich historical depth and character to the homes and buildings on Martha’s Vineyard. SunPower’s E and X-Series DC panels carry the International Living Future Institute’s Declare Label, which lists the materials they’re made of and other information that helps meet the criteria toward earning a LEED building certification. SMC considers zero-energy building, sometimes called net-zero building, one of their specialties. Around their office, they call it “zero net possible” because when technology, design, and building processes are all considered, it’s possible for the inhabitants to live or work in a building that produces as much energy as it consumes, but it depends on lifestyle. It’s possible, but not entirely predictable. What is certain, however, is SMC’s role in developing renewables on the island now and in the future. As a worker-owned cooperative, SMC’s business model is also highly sustainable. In 2025, the company will turn 50, and as its founders retire, existing partner-owners will take on those leadership roles and new owners will come into the fold. This ensures that the company, its values, knowledge and craft, will live on and continue to enrich Martha’s Vineyard and the lives of its people for generations. In the last of our three-part series, we’ll explore commercial and residential solar installations on the island. Follow the SunPower blog to learn how SMC applies their sustainability savvy to create multi-use public solar and net-zero affordable housing. Inspired by the Martha’s Vineyard story? Visit SunPower’s solar calculator to find out how you much you might save by going solar.